The new grouse shooting season, which gamekeepers hope could be "extremely productive", is getting under way. The traditional Glorious 12th fell on Sunday this year, so shoots were not beginning until Monday. In recent years a decline in the population and the spread of disease has seen grouse numbers dwindle. Animal rights' groups condemned the shoot and said grouse shooting had, in some places, gone from being a country sport to an 'industrial' activity. The Game Conservancy Trust experts predict a warm spring and rigorous pest control programme should result in an increase in shoots. Dr David Baines, head of uplands research with the trust, said breeding success this year had been "fantastic". "Red grouse are extremely resilient birds and fortunately the appalling weather struck when the young chicks were well-feathered, so survival rates have been good," he added. Speaking at the official launch of the season in Scotland's Angus Glens, trust director Ian McColl said: "It was a very mild winter and we had a fantastic spring, which meant the heather came away on the moors early. "This is important because it means the hen will lay more eggs. "A lot of the keepers have been very pleased with the number of chicks they saw." He added that measures to combat tick infestations had been effective. Louise Robertson, of the League Against Cruel Sports, said the increasingly lucrative nature of grouse shooting had led to concerns over the management of grouse moors. She said this included the increased use of snaring to catch predators threatening game birds. "In this day and age are we in a society where we want people going out shooting live targets for fun," Ms Robertson said. 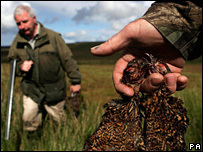 Areas of the Borders and west of Scotland are expected to experience good grouse numbers. But parts of Grampian and the Highlands may not fare as well due to recent heavy rainfall. The trust said much of Europe's heather moorland had been seriously eroded over the past century, but grouse shooting had helped reduce the rate of this decline in Britain.